While we have seen most of the phones listed for availability by the holiday season, two of the phones were new to us (but its not like we couldn’t imagine what they looked like). First up, the T-Mobile Tap is a low end touch screen with GPS, stereo Bluetooth, a 2 megapixel camera (with video) and a berry or midnight blue outer shell. The Nokia 3711 (another lower end phone) has a concealed external display, GPS with Nokia Maps built-in, 2 megapixel camera, and a “sable” finish. Oh, and both of these phones offer up 3G connectivity. These cost efficient phones are expected by the end of the year to help round out the low end. Leave your thoughts in the comments! The Tap looks to much like the Samsung Highlight. Is it going to be made by HTC? Tap looks like an uglier HTC Tattoo. Is that really possible? Dare I say it looks like the Tattoo reimaged as non android? Oh goodie!!!! 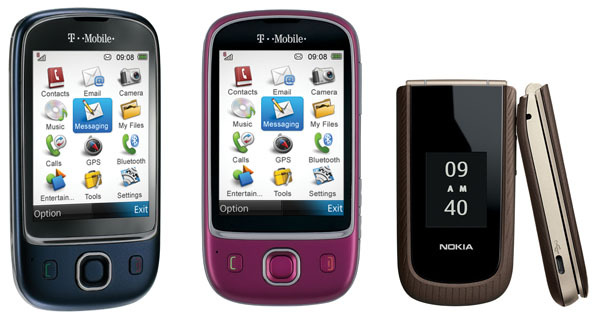 More crap phones for T-Mobile. Anyone see the new this week about the cool phones on their way to AT&T and Verizon? @JDean86 lol, your funny but its true. they are not putting the money on the right phones. I don’t know why there not trying to get the BB magnum (it touch with keyboard)also phone with the sense UI like the one from sprint i watch the unboxing on phone dog and it has the right features…I give up sometimes with T-mobile and i work for them, we could have a much better line up of phones. the only thing I can think of is that there not spending the money on the phone cause there spending a lot of cash on the network. It’s not the HTC Tattoo, everyone. It’s the Huawei U7510. Phonescoop is reporting the phone is made by Huawei. Well, I agree with you all that T-Mobile could be putting out some more high end phones. I don’t really have a problem with the news of these two lower end models though. From dealing with customers directly, I can tell you that the average customer is not buying the high end models, they are looking to get the cheapest phone available. If T-Mobile only released Winmo and Android phones, then they would lose their base of customers that is not wanting to have to pay a data plan. T-Mobile has to keep putting out different types of so called “low end” phones to stay competitive. The Tap is the same T-mobile Huawei that is shown on the t-mobile roadmap. The pictures shows the blue and red models. T-Mobile customers aren’t ONLY looking to cheap phones. I the mobile phone has evolved into a portable multimedia hub….people to that experience at all price points – high and low. The problem with T-Mobile is they’re catering to the bottom feeders (no pun) and are alienating the mid to high end customer base. Look at the competition…AT&T for example….they have handsets galore at every end of the price spectrum and in between, not to mention the coveted iPhone. T-Mobile’s lineup is laughable. A stable full of rehashed Android phones….NOTHING EXCLUSIVE to their network except for the very date Sidekick. T-Mobile would rather compete with Boost Mobile or MetroPCS….so it seems. They haven’t made one attempt at all to lock up a deal with a handset maker to release a truly phenomenal phone for their 3G network. They’ve lit up enough cities with 3G to make showcase how fast the network is but instead resurrecting Katherine Zeta Jones or some other washed up character is their strategy for getting the public’s attention. IT’S NOT WORKING! What T-Mobile really needs is someone like Steve Jobs…..a forward thinker. Dotson and his band of buffoons are killing the company from the inside out. Off with his head. I bought the Tap for my daughter for Christmas. I gotta say its a pretty nice phone and the internet is only $10 a month. I can’t tell a big difference between it and my wife’s Behold. The UI is remarkably similar. All in all its a good bargain. Well done T-Mobile.